This also is a Klamath Indian figure, obtained in the same way as "Two Little Boys Running Away." First: With the right thumb and index turn one string of the loop toward you about ten times, loosely, around the last joint of the left thumb. 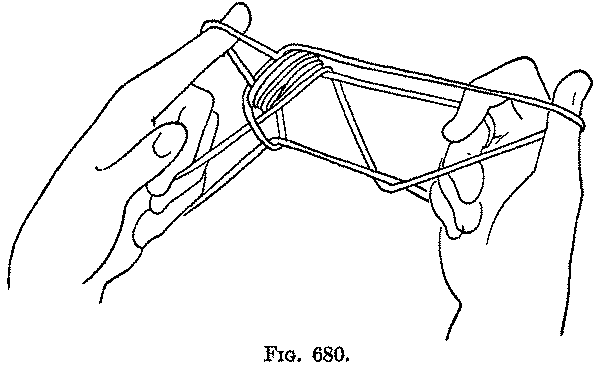 Then put the left index and the right thumb into the rest of the loop and separate the hands. 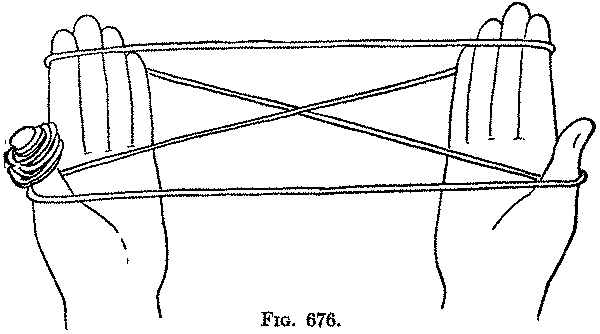 Now put the right index, from above, behind the string which passes from the left thumb to the left index, and pull the loop out, at the same time turning the right index away from you and up to its usual position (Fig. 675). 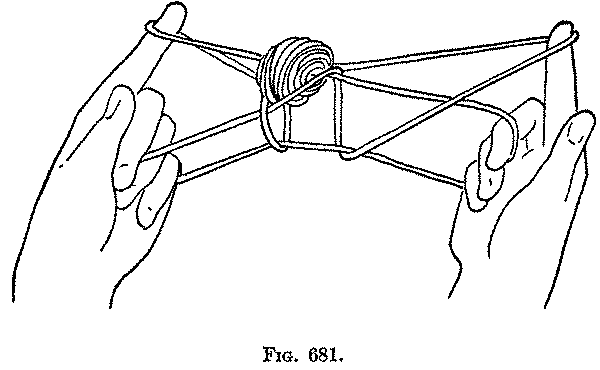 Second: Pass the middle, ring and little fingers of each hand from below into the index loop (Fig. 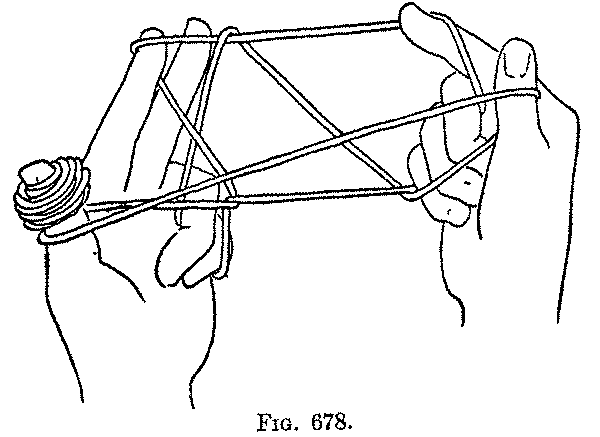 676), and draw the near index string down on the palm, then bring the hands together and pass the left middle finger to the far side and the left index to the near side of the right far index string (Fig. 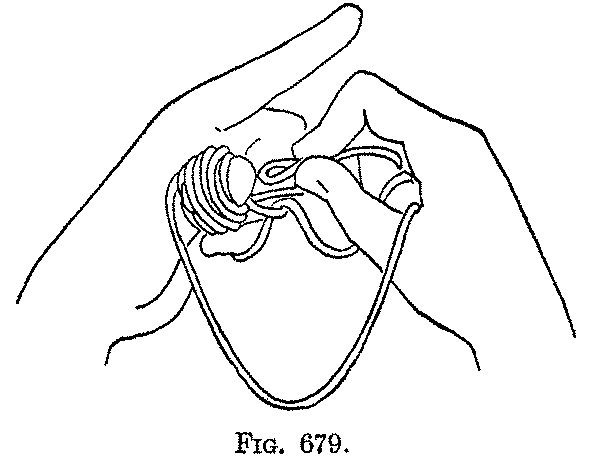 677), and draw this string to the left, between the fingers, through the left index loop and put it around the tip of the left index by turning the left hand with the palm away from you. During this movement the original left index loop slips from the finger (Fig. 678). Third: Release the loop from the right index. 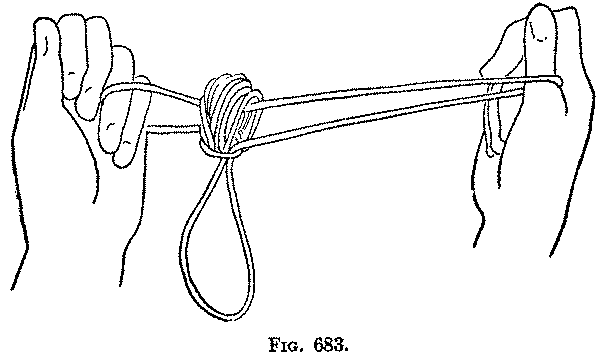 With the right thumb and index take hold of the two strings of the left index loop (close to the index), and lift the loop from the finger; then thread this loop from above downward through the turns on the left thumb (Fig. 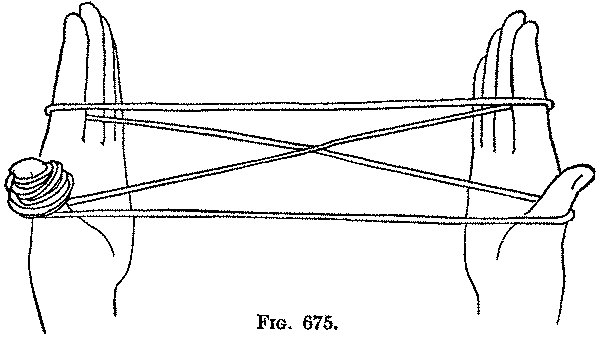 679), and put it back on the left index, withdrawing the left thumb from the turns (Fig. 680). Fourth: Transfer the right thumb loop to the right index, by picking up from below on the back of the index the near thumb string, returning the index to position and withdrawing the thumb (Fig. 681). Fifth: Pass the right thumb away from you into the right index loop, and, pulling down the near index string, pick up from below on the back of the thumb the upper string of the loop held to the palm by the right middle, ring and little fingers. Return the right thumb to its position. Release the right index loop and the loop held down to the right palm (Fig. 682). 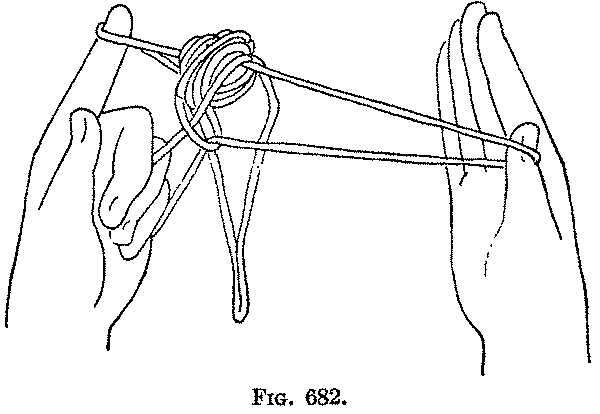 Draw the hands apart, and pull the hanging loop up into the ball of string by drawing on the right lower thumb string (the one which passes under the little and ring fingers of the left hand). 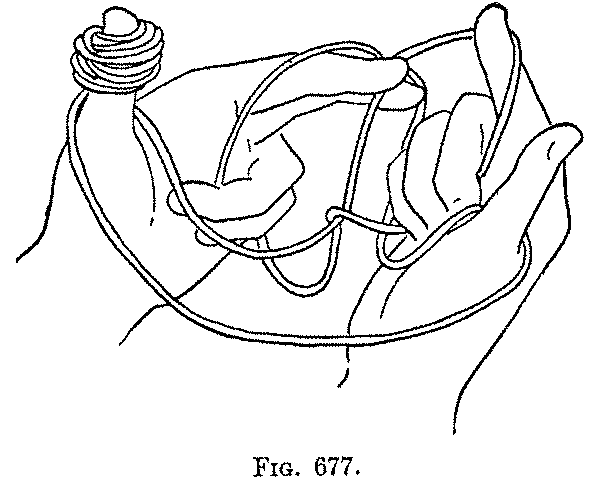 Release the loops held down to the left palm, and transfer the left index loop to the left ring and little fingers, and close these fingers on the palm (Fig. 683). The loop hanging down represents "the boy" and the ball of string "the bundle of wood" he is carrying on his head. The "boy" can be pushed far to the right, and then made to walk to the left by pulling on the right upper thumb string.